Today, learning experiences are work-embedded, social, and informal. They are flexible in terms of platform and schedule. Does your training meet these changing requirements? The answer is yes if you are Agile! 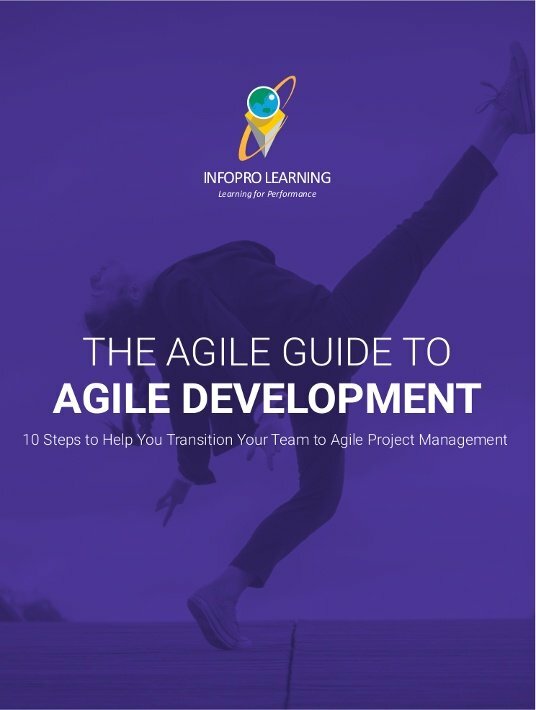 Infopro Learning put together this guide to help other learning professionals harness the power of Agile development. The guide includes ten steps to help transition a team to Agile project management, and help you anticipate the most common reasons for failure faced by Agile teams. This step is the primer before the paint. Just as primer ensures a smooth paint job and quality results, an Agile mindset ensures a smooth transition and quality output. Many teams choose to use the Agile method because their customers anticipate changes to the project requirements after the initial planning. However, just because there may be some unknowns about the requirements of an Agile project, it is still important to clarify what the team and customer do know at the beginning of the project. A backlog is a group of tasks that have not been assigned yet and need to be managed. In the Agile Method, Teams use a points system to give a high-level estimate of the scale or size of specific tasks in the backlog. Agile projects break project requirements into tasks and then break those tasks into smaller tasks. After tasks are as small as possible, each task becomes a feature. Once the features have been defined, you will be ready to create a Sprint backlog. In step 3, Create the project backlog, tasks were given high level estimates using a points system. In this step, features are organized into high priority and low priority to help plan what features to focus on in each sprint. The purpose of this meeting is to help your customers understand what to expect during their review at the end of each Sprint, especially if they are used to the ADDIE, or waterfall methodology. Agile Project Management has built in best practices for collaboration which include: Whiteboarding your walls, conducting stand-up meetings, and managing with post-it notes. The team Sprints to achieve the sprint goal or requirement explained to the customer in step 6. As the team works through the first sprint, ensure everyone sticks to the duration of the sprint decided on during the planning stages. actual progress, and annotations of key events for management and customers. At the end of a Sprint, invite the design and development team, and customers to review the Sprint deliverables. The Sprint review allows team members to demonstrate their accomplishments to the customers and to the rest of the team and allows the customer a chance to give feedback, preparing you for your next sprint. This guide is not step-by-step instructions for exactly what you should do to ‘be Agile’, because that would be against the very core of Agile. This guide provides you with a framework for how to transition your team to agile. As online training requirements are ever-changing and become more and more demanding, companies need to find a way to adapt and keep up. Agile Project Management is the way to go, and The Agile (indeed!) Guide To Agile Development is your best ally to adopt it successfully.